Boasting an architectural heritage that stretched back millennia and saw groovy new stadia built for the 1990 World Cup in Bari and Turin - and stadia especially renovated in Cagliari, Florence, Milan, Naples, Palermo, Rome and Verona - Italy let its violent and disappointing World Cup finals play out between disappointing, random sets of box-nets. And not even a fat man singing Puccini could hide Italy's missed opportunity to make its mark in the history of on-field architecture. 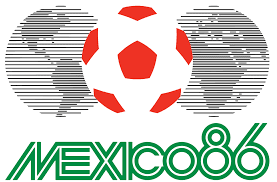 A dirty backroom deal awarded Mexico its second tournament in only sixteen years and gave FIFA a TV on which to broadcast to the world that at the end of the 20th century they wanted football to be like McDonalds - anywhere you went in the world, it'd all be the same. The enormous free-hanging box-nets installed at each stadium were not only a re-statement that the goals first seen in the 1974 tournament, were the first-class, on-field architecture of choice for the future. They also marked the beginning of the era of football as a brand on global TV. Previously you could sight the goalnets on TV and identify which stadium the game was being played in. After Mexico '86, it was possible only to glance up and say, "It's football."